How I Just Did It! About three weeks ago, I told the story of a waitress who asked how I wrote a novel, and I said, “I just did it.” A few of you didn’t think that was quite enough information and told me that you wanted to know more details. Well, you asked for it, so here ya’ go! First of all, everything I write gets its own notebook dedicated to my obsessive need to be organized which also serves as a crutch for my complete lack of memory! This novel got a green notebook labeled “SHADOWS” – that’s not the entire name of the manuscript, but it’s one of the words in the title. 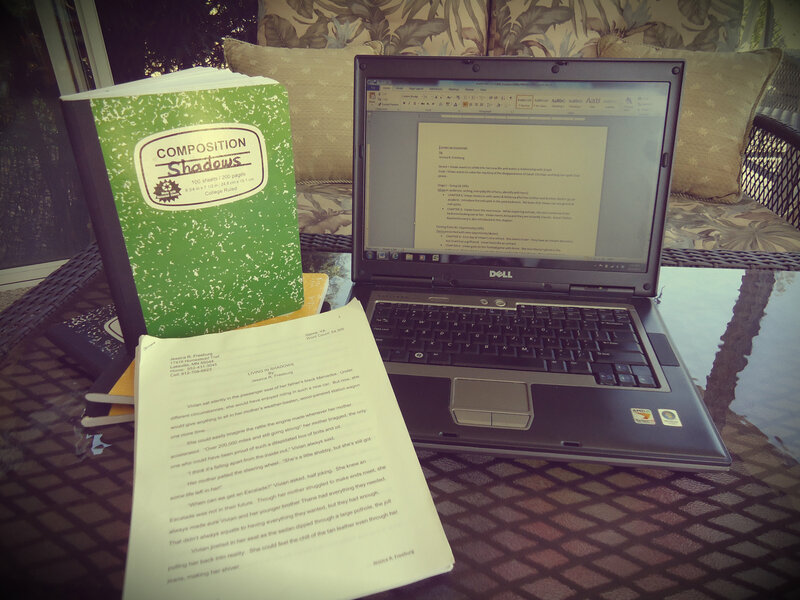 Ta-da…my laptop and my notebook. You’re riveted, I can tell. 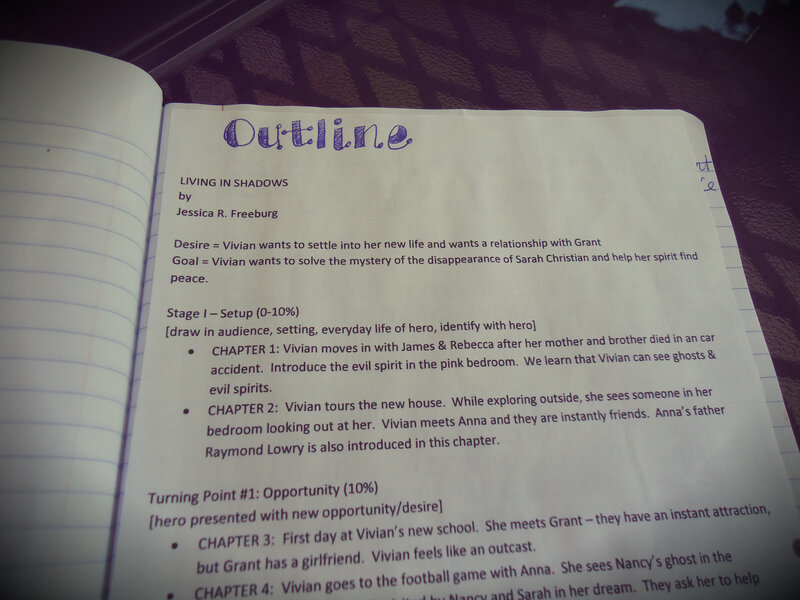 I’m one of those writers who actually uses an outline. I didn’t start out with one, but a few chapters into my novel, I began writing a screenplay with a friend who introduced me to the proper way to outline a screenplay. It made me think about things like turning points and a climax. When I got done writing the outline for our screenplay, I could see the movie in my mind from start to finish. I loved it! So I decided to use the same format for my novel. I’ll talk more specifically about my outline in another post because apparently I’m kind of a nerd, and I could carry on and on about how much using a screenplay outline to write my novel totally rocked! After typing up my outline, I printed it. Then I cut and pasted it into my “SHADOWS” notebook. More evidence of my nerdy ways. Okay, so there was a little information on this page that might have given away more about my story than I want you to know before you read it. 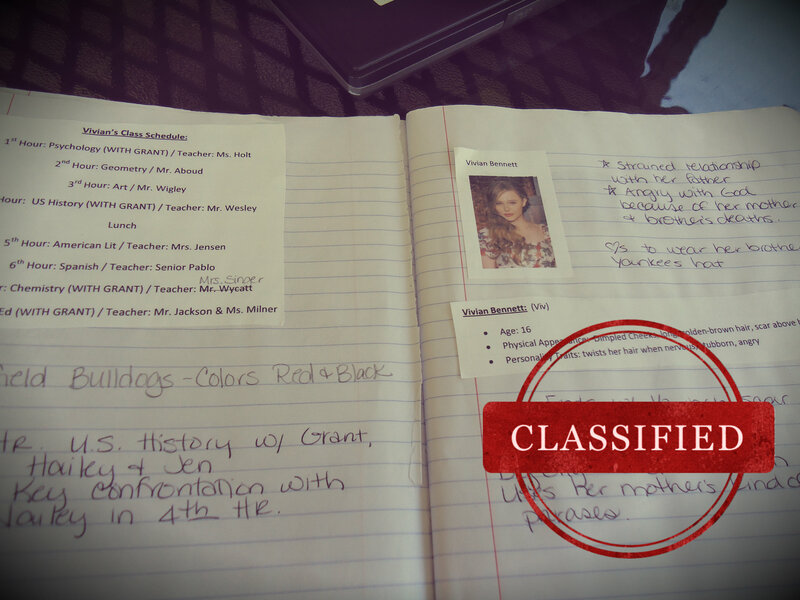 So I applied a “Classified” sticker using a photo editing program on my laptop. Clever, right?! Once all of my main characters had a face and page with details about their physical appearance and personality traits, I made a page for my supporting characters. These guys and gals didn’t require pictures, but I needed to remember who was who and if I said Clare had long, brown hair in chapter 3, I didn’t want to make her a blonde with a pixie cut in chapter 9. I’m actually a little embarrassed to show you this next picture because now you’ll know I sit around and doodle in my notebooks, but I’m a visual person and I NEED to see things. So in order to keep certain key places clearly laid out in my mind, I drew maps and pictures! 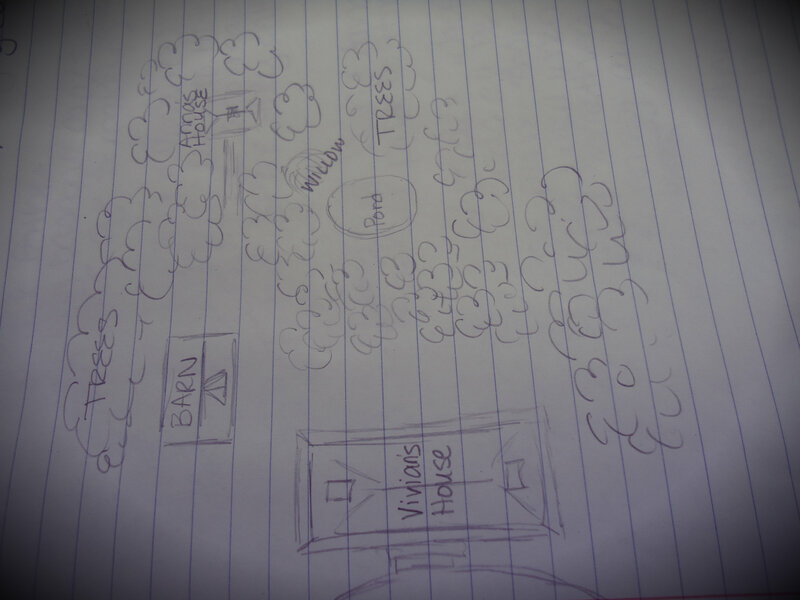 I won’t show you the bedrooms and school that I drew, but here’s a little map of Vivian’s home and the area around it. Don’t laugh! My high school art teacher would be so proud. Wait, I never took art in high school. Well, if I was five-years-old, my mom would TOTALLY put this picture on the fridge! Okay, okay…stop laughing! I can’t show you any of the other pictures because they are beyond dorky! I drew bedrooms with curtains and window seats. I drew a family room with a fireplace and bookshelves. In my defense, at least I didn’t draw them with crayons. In all seriousness, I actually refered to most of the pictures as I wrote. The truth is, I’m a little like Dory from FINDING NEMO…I suffer from short-term memory loss. Well, it hasn’t been diagnosed by a professional or anything, but I’ve got three kids who I’ve over-scheduled with sports and dance (did I mention one sleepwalks through the house turning on all the lights in the early morning hours at least a couple of times a month and another is a toddler who still hasn’t figured out how to sleep through the night…it’s a miracle I remember to breathe some days). My notebook filled with my goofy drawings, photos of celebrities who look like the characters I envisioned in my mind, and my screenplay outline written for a YA novel were all essential parts of my writing process. They helped me keep straight the 20 chapters of people and places I had fabricated in my mind (typically between the hours of 9pm and 1 am – while “normal” people slept). So there you have it. A little more information about how “I just did it.” Now, if all you took away from this post was that I have eaten both glue and my child’s boogers, well…whatever! And if it helps you organize your thoughts as you plot out your own manuscript, then it was worth my shame in exposing myself as a booger eating, glue licking woman who doodles pictures that could have been drawn better by a blind chimp. This is fantastic! Explains perfectly how you do not have consistency issues. I LOVE notebooks and journals and anything with blanks pages I can scribble on and cut and glue things into. I though Pinterest would cure me of the obsession, but it hasn’t. Great post!! Thank you very much for all your tips!! It was great!! !